Wow! That's great! Thanks for you info man. You are a very wise man! I want to move out of California, this is the worse state of the union. Lots of corruption, lots of taxes to pay for the illegal aliens and politicians luxurious living, traffic is horrible, lots of crime, drugs, crazy Hollywood people, you name it. Yeah, one needs a 150 cc legally to get on the FWY so they say but I have seen many 125cc and even scooters on the FWYs. Once I learn more ridding this bike, because I'm a new biker, I'm planning to get on the 10 FWY since the top speed at 3pm is like 20mph or less. I thought lane splitting was Legal in Cali you shouldnt be sitting in any traffic. Yes, this is the only good thing in California, you can split lanes of course in a motorcycle. But I'm taking the streets since I'm afraid still to go on the FWYs. Yes, this is horrible, no way to go in a car about 4pm, just idling. This is exactly why I got the Grom in the first place, even on the Grom still takes me like 45 minutes to get home in the afternoon. I appreciate your info. Keep ridding safely. Interesting no one tells exactly how many mpg they get in their bike. I'm the only one here who keeps gas mileage logs. My Grom is averaging 139.0 mpg and my 12 year old DRZ400 is averaging 69.4 mpg. Tank wise, I don't know what I get, all I know is when my gauge starts to flash I'm looking for a gas station. Most fuel I've put in at one stop is about 0.92 gallons. I don't remember what the MPG worked out to be on that but it was around 70-80mpg (181cc rich tune). All I know is I took a sharp turn right after gauge started to flash an I starved the engine of fuel. So regardless of 1.5 gallons of fuel or not, less than 1 gallon is useable for how I ride my Grom. I'll take some notes and see what I'm getting at the next fuel stop. I was running a rich tune but just leaned it out about a week ago so we will see. I bought the Grom for daily commute only not to do wheelies. I don't want to keep paying $300 a month on gasoline and sitting 4 hrs in traffic daily. I bought my Grom for the exact same reason, my HD Street Glide can't move though the traffic as easily. Question is why are you sitting in traffic with a Grom? If it takes me 15 minutes to get to work in the morning, I know for a fact it takes 15 minutes to get home in the afternoon heavy traffic if I'm on my Grom. Reason why my Glide doesn't get any love from me during the weekdays now, lol. I bought the Grom for daily commute only not to do wheelies. I don't want to keep paying $300 a month on gasoline and sitting 4 hrs in traffic daily. Have you driven at 7am or 4pm in the 405, 10, 5, 710, 105, 110 fwys lately? I'm the same, John. 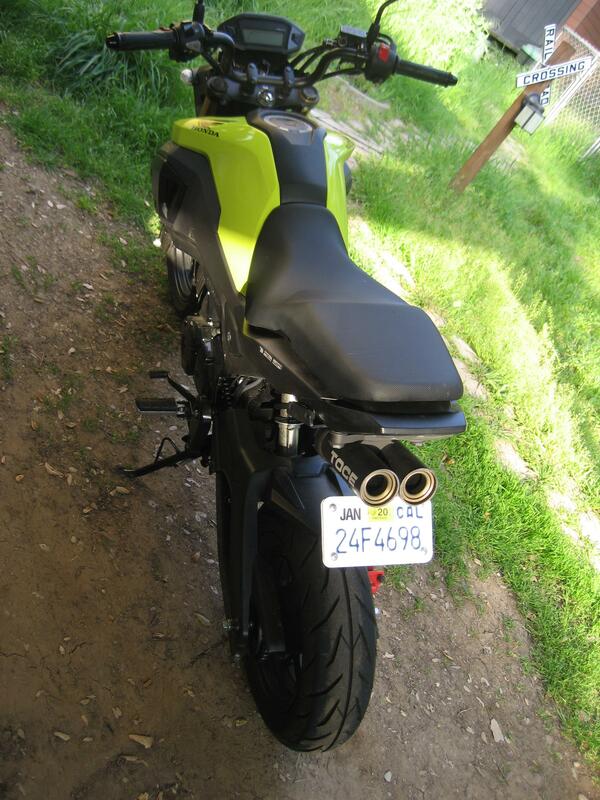 I ride my Grom for cheap daily practical useful transportation, not to perform circus clown tricks on it. When there's traffic I lane split... but ONLY through vehicles that are standing still waiting for red lights... NEVER when they're moving. That's suicide. Way too many sudden lane changers. Even at today's gas prices my fuel cost is only 2.5 cents a mile. Last edited by tooter; 04-04-2019 at 10:35 AM. I ride my groms like I stole it in Santa Clara Silicon valley where every other car seems to be a Tesla electric or some fancy BMW, etc. But they are stuck in traffic while I zip on thru on the grom and move out of the way of bigger faster MC that also split lanes. The grom is great in the City of San Francisco esp down at fishman's wharf area or crossing any of the bridges in the Bay area. The only down side in the Bay area with the grom is that it sometimes can't trigger the Left turn lane lights so I wait till it is clear and make a left turn when it is safe. Usually if I have to wait for a second change of light for a left hand turn and the light does not change to a left arrow that is when I do the hooligan left turn. Last edited by john2018; 04-04-2019 at 11:06 AM. my big ole 2004 honda 919 (919cc's) with rather antiquated and simple fuel injection gets ~ 50mpg if im nice, 40 if im blasting the canyons. CC isnt everything... my WR450 dirtbike gets ~30mpg with half the ccs of the big street bike. But i see what you are getting at. In my situation there are always cars waiting (stopped) to make the left hand turn, so I just go in front of the first car and I raise my left hand to ask their permission and they are always OK for me to proceed ahead. If they are already moving I stay behind the cars and act as normal car. If I'm the first one to make a left hand turn I wait until all opposite traffic is completely stopped and watch for pedestrians crossing before I proceed. Never assume that your way is clear to go.